Mashi Theatre’s travelling storytellers stop by to share the colourful, enchanting Tales of Birbal. Tales that have been treasured by generations across the Indian Subcontinent for centuries, now Mashi invites a new generation to unearth the richness in these legends. How many crows are there in this land? Which came first, the chicken of the egg? Only Birbal knows ... Whatever the question, Birbal, the cunning advisor to Mogul Emperor Akbar has the answer! Featuring live music, the players stumble across an audience in a man-pulled rickshaw and begin to unpack these ancient tales. 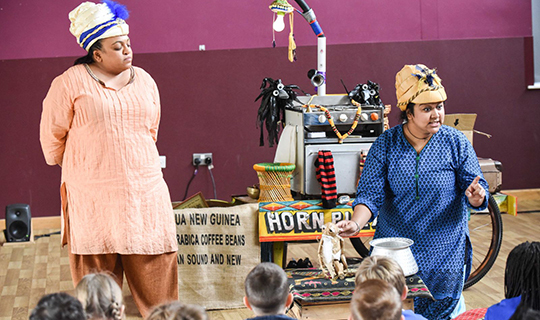 Tales of Birbal was a co-production with The Spark Arts for Children and is supported by Arts Council England.